Confessions of an ADD English Teacher: Pin Inspiration Thursday! Happy Fall, y'all! Micki, from Confessions of an ADD Housewife, hosting the party this week! The weather is finally cooling off. It was right around 80 degrees today in my neck of the woods. My favorite part of the year when I don't have to run the heat or the air. We had an amazing party last week with 134 entries! That's a lot of creativity to look through and pick my favorites. Thank goodness, I don't have to pick just one! First off, I have to admit I'm a sucker for anything Caramel Apple. Adorned from Above shared this wonderful Caramel Apple Cheesecake. I'm dying here...can't wait to try the recipe! I love a good chair redo. This time, Dixie Delights shares her chair and the bargain she got on the fabric. I admit, though, I was kind of digging the before picture. And finally, how could I not share this jaw dropping transformation from One Creative Couple. I think she has more creativity in her pinky than I could ever muster! 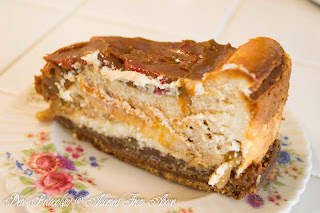 Thank you so much for featuring my Caramel Apple Cheesecake. What an honor. I really appreciate it. Thanks for hosting. I couldn't find your button. Am I looking in the wrong place? Bloggy glitch! I'll post it as soon as I can get back to my computer. Thanks for a great party -- appreciate the invitation! Thank you so much for this link party! I followed you on google+ a week or two ago when there was a party for that I think - that's how I found this link up!